Start your summer off with a ‘rockin’ good time! Join us for a special story hour on Thursday, June 29th from 4:15-5pm with Bonnie. 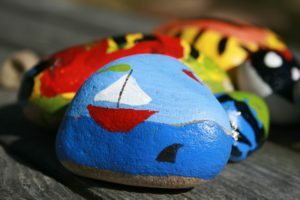 We will provide the medium sized rocks and you will provide your artistic ability! The library wants to create a beautiful rock garden as a part of our gorgeous landscape and we thought who better to help us than our story hour friends…the rocks will remain at the library. Please remember to park next door at the Town Hall Annex if our parking lot is full!